This is a project I made quite a while back (about 7 months ago). I wanted a bigger display for a project of mine and noticed that PlayStation Portable displays (480×272 pixels) are quite cheap on eBay but they do not have an integrated controller/display driver. It seemed like a perfect project to practice using FPGAs so off I went. The PCB is a 4-layer design containing an Altera Cyclone II FPGA (EP2C5, 4608 LE), two buck-converters (1.2V core voltage for the FPGA, 2.5V for “main” power), 3.3V linear regulator for the configuration device, current-mode step-up SMPS for the backlight (which needs around 18V), configuration device, oscillator (20MHz) and an asynchronous memory chip (IS61WV10248BLL, 1x8M) for the framebuffer. It also has some general purpose LEDs and 20-pin IDC-connector meant to be the “input data bus”. The PCB was designed so that it would be possible to “wrap” behind the display and be securely glued or otherwise (double-sided tape) attached there. The display is LQ043T3DX02. I managed to get the display running pretty easily despite the datasheet containing quite a bit of chinglish so I had to do some experimenting. I haven’t implemented the data bus or the framebuffer yet but I’ll promise to make a new post when/if I get around to it :)! Thanks a lot to jahonen for helping me out with VHDL and other stuff! The datasheet reads 30v for the backlight. Is that what you supplied it? Hey! The backlight is a bunch of LEDs in series so they need to be supplied with a constant current. The SMPS powers them with a constant current (can’t remember what the current was but probably like 20 mA) and then the voltage over the LEDs will end up being around 30 V.
Awesome design. Any plans on sharing the PCB Design? Hey Jose! Sure I could share the PCB design. I’ll try to remember to find it after work. I like Xilinx Spartan chips myself – but I’m impressed with your design. How much of the FPGA do you use – and how much current does it draw? I’d like to make a calculator-style device, but I suspect the current of FPGA’s would drain batteries pretty fast. Xilinx does have nice chips but I personally find their software to be pretty poor compared to Quartus. 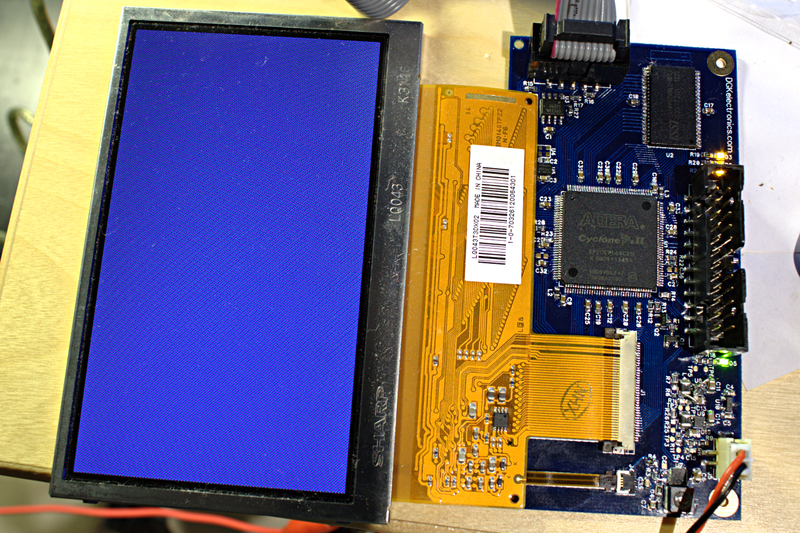 i make controller for this TFT based on PIC24FJ256DA210 and SRAM-256X16 with 60x30mm. Also works fine but this better ! Hey X893! Thanks for the compliment!